Gabriella is a Dunmer assassin who works for the Dark Brotherhood. Gabriella wears shrouded robes with matching hand wraps, shoes, and hood and is armed with a steel dagger. She also carries ten iron arrows and a bowl. She lives a quiet existence in the Sanctuary, getting up at 8am. She then spends the rest of the day either sitting around, using the alchemy table or arcane enchanter, or conversing with her fellow assassins. Then, at midnight, she'll head to her bed to get some sleep. When you greet her, she'll have some cryptic sayings involving death ready for you, stating, "Does death not come to us all? Is it not a certainty? I am, therefore, honored to be doom's herald. To play some part in a being's inevitable end. ", "In the Dark Brotherhood, I found acceptance, love, and my life's true purpose. ", or "Death is but the time to sleep forever, in the Void." She might also greet you with a more normal "Sithis' whisper be upon you, brother/sister." If she notices you sneaking by her, she'll say, "It would seem you're not the accomplished pickpocket you think you are..." When asked about herself, she replies, "What a curious question. Well, I enjoy moonlit nights, taking long walks on the beach, knitting and unicorns. In fact, I once took a seaside stroll, on a moonlit night, and discovered a unicorn... which I proceeded to stab in the throat with a crochet needle. I'm a woman of refined, yet simple tastes." She also welcomes the arrival of Cicero and the Night Mother, saying "Without the Night Mother, there is no Dark Brotherhood. The Matron deserves our unwavering support and respect. Though I admit, I find her Keeper a bit too exuberant for my liking." 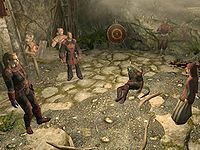 If you disrespect the family, she'll say, "If the Tenets were still in place, you would be required to defeat the Wrath of Sithis. Now you just need to pay a fine to Nazir. Ah, the Old Ways..." When exiting conversation, Gabriella will say either "Walk always in the shadow of Sithis. ", "May the shroud of death embrace you." or " Darkness guide you." 2.5 Destroy the Dark Brotherhood! Bound Until Death: Assassinate Vittoria Vici at her own wedding. Death Incarnate: Assist Brotherhood members in the fight against the Penitus Oculatus assault. Destroy the Dark Brotherhood! : Finish the Dark Brotherhood and rid Skyrim of their kind. Arnbjorn: "Ha ha ha ha ha ha ha!" Veezara: "Ha ha ha ha! Again! Again! Do the part where he tries to buy you some candy." Babette: "Okay, okay. Wait. Here we go. "Ooh, you are such a pretty little girl. Would the sweetie like a sweetie? Oh yes, how about some chocolate?" Oh yes, please, kind sir. My mama and papa left me all alone, and I'm so very hungry. I know a shortcut to the candy shop. Through this alley. Oh ya, very good. Very good. My it is dark down here. Oh, but you are so beautiful. Such a lovely smile. Your teeth... your teeth! No! Aggghh!!" Gabriella: "Oh Babette, but you are so wicked." Nazir: "What about you, Festus? How did that last contract turn out?" Arnbjorn: "Oh, yes, please, old man. Regale us with your tales of wizardry..."
Festus Krex: "Ah, the young and stupid. Always mocking the experienced and brilliant. My contract went very well, I'll have you know. Tried a new spell. Little something I've been working on in my spare time. Came "this" close to turning that priest inside out. Damned messy." Gabriella: "And what of your latest, Arnbjorn. Something about a Khajiit? Merchant was it?" Babette: "Oh, a big doggy chasing a little kitty! How adorable!" Nazir: "Ha ha ha ha ha ha ha ha ha!" Festus: "Ha ha ha ha ha ha ha ha ha!" Veezara: "Ha ha ha ha ha ha ha ha ha!" Arnbjorn: "I am not adorable, it was not funny, and he wasn't a merchant. He was a Khajiit monk, a master of the Whispering Fang style. But now he's dead... and I have a new loincloth." Arnbjorn: "Ha ha ha ha ha ha ha ha ha!" Babette: "Ha ha ha ha ha ha ha ha ha!" When you first talk to her, she'll say, "New brother/sister. May I offer my most sincere welcome to our Family." After this, you'll get three options, regardless of which response you choose she will say "You certainly have a strange energy about you. I look forward to following your progress." At the end of Mourning Never Comes Astrid will refer you to Gabriella with words: "Now then. Time to proceed to the next stage of the plan. Go and speak with Gabriella. She's been helping me arrange your next contract." Should you have talked to Gabriella both after killing Vittoria Vici, but before reporting back to Astrid, she will say "You and I have business to discuss. Ah, but you have not yet reported back to Astrid, have you? Do that, and then we shall talk." When you are ready, speak to Gabriella, who will inform you about the next contract "Dear brother/sister. I've been waiting for you. Your next contract awaits, as I'm sure Astrid indicated." 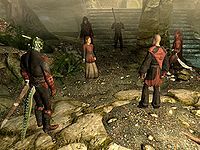 You are then able to ask about the details, to which she'll say "With the Emperor's arrival in Skyrim now a certainty, his security service, the Penitus Oculatus, will need to begin its preparations immediately. Security is being handled by a Commander Maro. Astrid and I have devised a plan to break the man, and in doing so, cripple the Emperor's protection. You are to slay the commander's son, Gaius Maro, and once he is dead, plant false evidence on his body implicating him in a plot to kill the Emperor." Upon hearing this, you'll get three possible responses, each resulting in the same followup '""He is set to leave the Penitus Oculatus outpost at Dragon Bridge, and inspect the security of each city in Skyrim. Go there now. Observe Gaius Maro's departure, and follow him. Waylay him in one of the cities, and send his soul to Sithis. Once he's dead, plant the incriminating letter on his body, and let fate take care of the rest. Oh, and one final thing..." Asking what she means will have her elaborate '""To earn your bonus, do not kill Gaius Maro in Dragon Bridge, or on the road. Kill him in one of the other major cities he'll be visiting. There, the body will be discovered quickly, as will the letter implicating Gaius Maro in the plot to assassinate the Emperor. Do that, and Astrid has authorized me to grant you a rather unique bonus. It is a special token, to be given to Olava the Feeble, in Whiterun. Olava is an old and dear friend, and a powerful seer. The token entitles you to a reading of your future. It's an opportunity one should not pass up." From here on, you are free to leave but you can also ask more information about the contract. You could ask Gabriella what killing Gaius Maro would accomplish and she would respond with "Killing Commander Maro would do no good. Someone would merely replace him. No, we need him to remain in charge. But... distracted. Weakened. Implicate and kill his son Gaius, and the commander will be grief-stricken and humiliated, his family name ruined. The security plan will then fail. Best yet, the Emperor will be lulled into a false sense of security, thinking an assassination plot had already been discovered and foiled." You could also ask her if she knows Gaius' schedule, to which she'll point you in the right direction "No, so your best plan is to follow him after he leaves Dragon Bridge. However, there is one other option... We know there's an actual written travel schedule, somewhere in the Penitus Oculatus outpost. Securing that would, obviously, be most beneficial..." And lastly, you could ask her about Dragon Bridge, this would have her elaborating on the Penitus Oculatus presence "It's a small town, with one rather unique feature - it houses Skyrim's only Penitus Oculatus outpost. It was established by Commander Maro when he first arrived in Skyrim, several months ago. When he began preparing for the Emperor's initial visit." If you return to Gabriella before killing Gaius, she will be disappointed, saying "Gaius Maro still lives. I am surprised. I had assumed you were more... competent." If you return to her after killing Gaius, but didn't plant the letter, she'll be even more annoyed "Why are you here? Killing Gaius Maro is but the first step of your contract - you must also plant the incriminating letter on his body..."
When you return to the Sanctuary, you'll be immediately greeted by Gabriella with the words "Ah, at last. I've been anxiously awaiting your return." Once you tell her that Gaius Maro has been successfully assassinated, she will reveal to you what happened while you were away "Yes, I know. As does Astrid. And you've earned your payment, though the bonus is forfeit, as I'm sure you're aware. But you should know that we have a more pressing matter to deal with. It's... Cicero. There's been an incident. You should proceed into the Sanctuary. I'll let Astrid explain." Should you stall instead of going directly to Astrid, she will say "This is not the time to keep Astrid waiting." Babette: "Just try to relax, Veezara. Let the elixir do its work. You'll feel better, shortly." Veezara: "Achh... Thank you, dear. You are most kind. The jester's cut feels as bad as it looks, I'm afraid." Astrid: "Damn it, this never should have happened! We knew better. We knew better, and still we let our guards down. Agh!" Festus Krex: "I'll admit, even I'm having a hard time disagreeing with you..."
After this, Gabriella will have rejoined you. Should she be talked to, she will describe the scene that happened to you "It was a truly terrifying scene. Beautiful, in some respects." When you finish To Kill an Empire, and return to Sanctuary, you will find Gabriella murdered by the Penitus Oculatus in the room of the Sanctuary with the arcane enchanter and the alchemy lab. 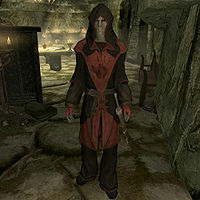 During Destroy the Dark Brotherhood!, you will be sent to kill every Dark Brotherhood member in the Dark Brotherhood Sanctuary, Gabriella will be one of the required people to kill. During this quest, she gains the spell Conjure Flame Atronach, as well as a leveled bow with leveled arrows, leveled gold and gems, and a leveled health restoration potion. She also retains her steel dagger. Mourning Never Comes "You're being sent to meet with the contact directly, is that correct? What a most unusual occurrence. Astrid usually performs this duty herself. I can only assume she wants to test the full breadth of your abilities. So. Be polite, and professional, and represent us well." Whispers in the Dark "To what end? Usurping Astrid's authority as leader of the Sanctuary? Hmmm... Yes, I can see her concern. Thank you for bringing this to my attention." The Silence Has Been Broken "If the Night Mother truly spoke to you, if you really are the Listener... your destiny was written in the Void. Astrid is right to fear your power." Bound Until Death "I hope you don't mind, but I took the liberty of surveying the site of the reception. There's a small parapet, just opposite the balcony, that would prove an excellent spot for a long-range kill. I left something there for you. If you're inclined to take that approach." The Cure for Madness "I feel only pity for Cicero. He must die, of course, but can any of us truly blame him for his actions? We mocked him, disrespected the Old Ways. Our actions were shameful. Surely, the Night Mother weeps this day." Recipe for Disaster "You've been directed to dispose of the Gourmet's body, is that correct? I often find water to be a suitable hiding place. A lake, a pool... the sea." To Kill an Empire "What an honor, the assassination of an Emperor. And all because you are the Listener, favored by the Night Mother, anointed by Sithis. I am so very happy for you. If not a bit... envious." Gabriella's corpse is actually a different NPC, and does not wear a shrouded hood nor carry her inventory contents. Originally, during the quest Breaching Security, rather than just telling you about the bonus, you would've been able to ask Gabriella "Is there any way to earn a bonus?" To which she would respond with "Yes. Do not kill Gaius Maro in Dragon Bridge, or on the road. Kill him in one of the other major cities he'll be visiting. There, the body will be discovered quickly, as will the letter implicating Gaius Maro and the Stormcloaks in the Emperor's assassination. Do that, and Astrid has authorized me to grant you a rather unique bonus. It is a special token, to be given to Olava the Feeble, in Whiterun. Olava is an old and dear friend, and a powerful seer. The token entitles you to a reading of your future. It's an opportunity one should not pass up." This seems to be an early version of the explanation she gives in the final game, interestingly, in this version the Stormcloaks get named as conspirators against the Emperor as well, similarly to what the false evidence states. Gabriella carries an inexplicable bowl in her inventory, along with ten iron arrows. The fact that she has arrows coupled with the fact that she receives a leveled bow during Destroy the Dark Brotherhood!, makes it seem very likely that the bowl should have been a bow. This issue has been addressed by version 2.0.4 of the Unofficial Skyrim Patch; Her bowl got replaced by a long bow. Gabriella did not get correctly added to the DarkBrotherhoodFaction, meaning that crimes against her go unreported. This page was last modified on 13 March 2019, at 02:40.